Idiobiont endoparasitoids of insect and spider eggs. Popovici OA, Vilhelmsen L, Masner L, Mikó I & Johnson N. 2017. Maxillolabial complex in scelionids (Hymenoptera: Platygastroidea): morphology and phylogenetic implications. Insect Systematics & Evolution 48: 1-125. Taekul, C., Valerio, A.A., Austin, A.D., Klompen, H. & Johnson, N.F. 2014. 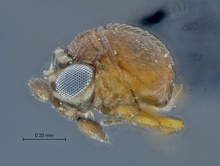 Molecular phylogeny of telenomine egg parasitoids (Hymenoptera: Platygastridae s.l. : Telenominae): evolution of host shifts and implications for classification. Systematic Entomology 39: 24–35. Photographs © Simon van Noort or Candice Owen (Iziko Museums of South Africa).